Whew. I’m somewhat behind since I’m still going though what is essentially jet lag as I prepare to start my new job with new hours of operation. Regardless, I did want to report in for last week, which was a disaster, thanks to WAY to much celebratory activities on my part. As such, I gained more weight, clocking in at 340 pounds. *_* My second fast day was completely killed (my fault as I should have just stuck to my guns and not given into the temptations), which really made a bad situation worse. Still, this is a new week, and with it comes a renewed desire to get back on the wagon and do the right thing. Since I like to discuss foods during my 5:2 Diet entries, I thought I’d touch on one of the smaller splurges I did last week. 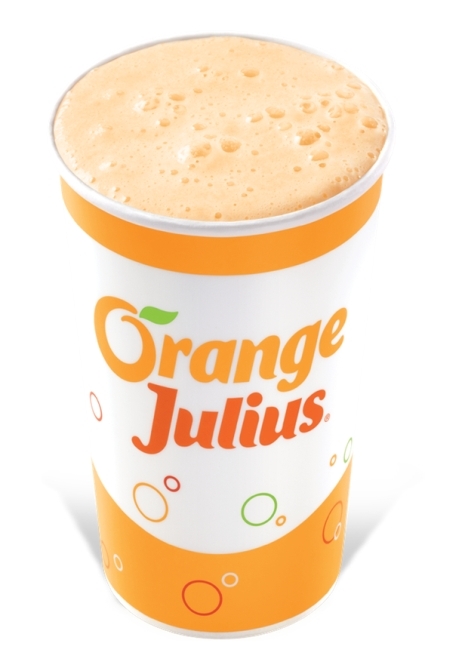 I had recently learned that there was now an Orange Julius in town (it may have been there for a while, who knows), which was a childhood treat for me. As I think back to those days, I remember when my mom, for whatever reason, decided to treat us to an Orange Julius from time to time. Of course, every time we’d get taken to the mall, we’d always ask Mom to get us one, but she always kept it as a treat, meaning it was a once in a while thing. Thus, Orange Julius always has a special place in my mind because it was a treat. Fast forward to the present. I couldn’t say how many years it had been since I’d had an Orange Julius. I’m thinking it was probably twelve years ago. As such, since I was in a celebratory mood, I decided that I’d get an Orange Julius sometime last week. I mentioned this to friends and family, all of whom said that the place wasn’t what it was and suggested I just make my own. I don’t own a blender and I’m not buying one just to make my own version of Orange Julius, so I went anyway. It may have been because my expectations were low, based on the comments I received, but I thought the Orange Julius I bought, though expensive, was pretty good. There was a slight separation issue as the sweetness seems to go to the bottom so that once you consume a certain amount of the icy beverage, the rest isn’t so sweet and certainly not so vanilla tasting, just more orange but not so sweet. Still, I don’t regret making the purchase. It is a shame I didn’t limit my celebrations to just a single Orange Julius, otherwise I wouldn’t be in the mess I ended up in. This entry was posted in Weight Loss and tagged 5:2 Diet on August 19, 2013 by AstroNerdBoy.